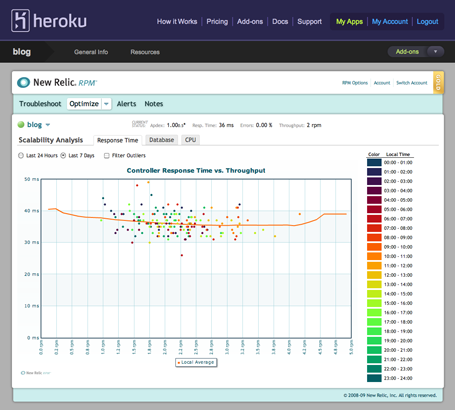 A couple of weeks ago we announced that New Relic RPM Bronze is available free of charge for all Heroku customers through the our add-on catalog New Relic RPM is a application performance management tool that allows you to monitor, troubleshoot, and tune the performance of your Heroku app. One-click integration with the Heroku platform means that you can activate an RPM account and start monitoring your application in just minutes. Here’s more great news: now you can upgrade to RPM Silver or RPM Gold, through the same add-on catalog. RPM Silver and Gold are charged per dyno-hour, so it’s only based on your actual usage of Heroku. RPM Silver enables error tracking and transaction tracing on specific slow transactions. RPM Silver provides details about each new deployment of each application including before and after comparisons, and performance data is retained for 30 days for ongoing analysis. RPM Gold adds analytic capabilities that help you shape the application’s performance over time: Scalability Analysis, Capacity Analysis, Long-term SLA Trending, Database Analysis, Transaction Report, and Deployment History. Performance data is retained for 90 days. To find our more about using the New Relic RPM add-on, join us on December 15th at 9 am Pacific/Noon Eastern for a 30-minute webinar “Heroku Add-ons: New Relic RPM.”, or start using the add-on today. Update: The archived webinar is now available.